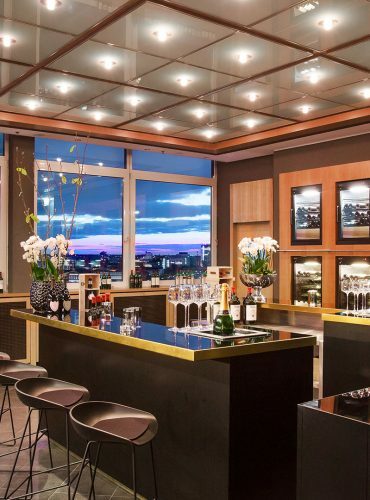 High atop the Intercontinental Berlin – the 14th floor, to be precise – Hugo’s Restaurant is the highest fine dining restaurant in Berlin, a culinary destination which relies on German produce and a strong team ethic to produce a delightful dining experience. 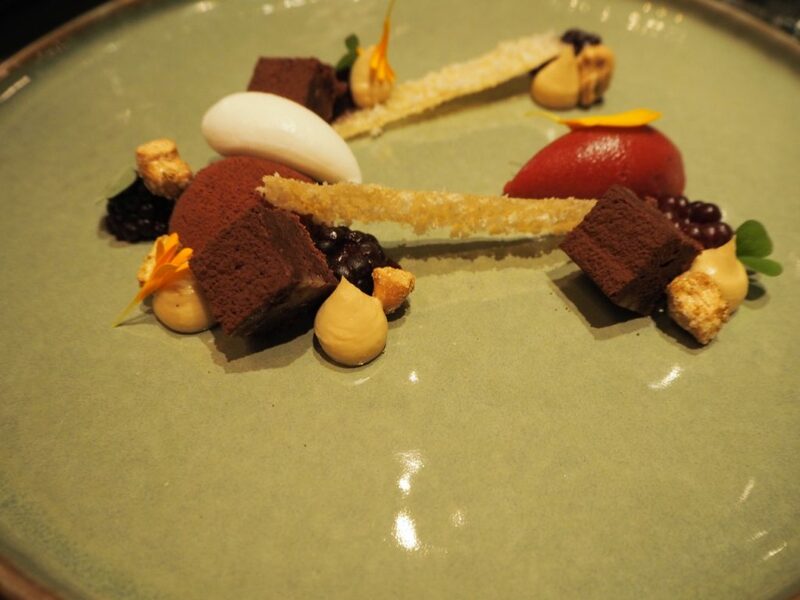 Chef Eberhard Lange presents modern European food with a range of influences in a creative style and the restaurant has possessed a Michelin star since 1999, as well as a host of other awards. Emerging from the lift, one is met by a spectacular view of the brightly lit metropolis of Berlin. 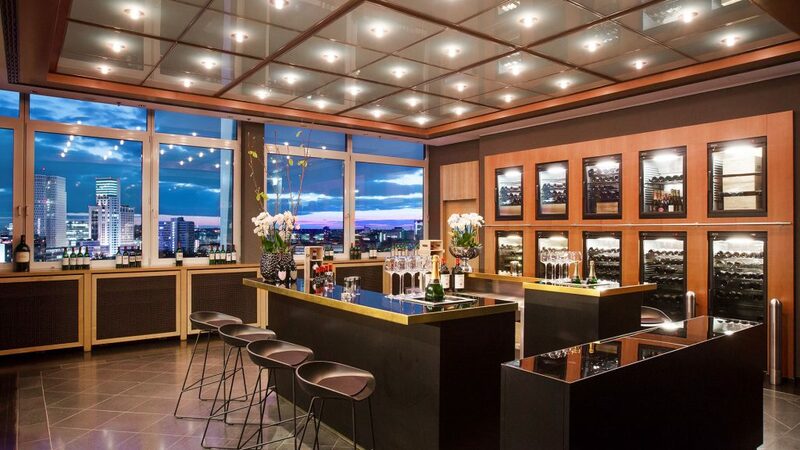 This view can be enjoyed from a bar areas as well as from a number of tables in the restaurant so furniture and walls are dark to draw attention to the view; lighting in the bar is minimal, but it is brighter within the restaurant and illuminates the food perfectly, along with some modern batik artworks. 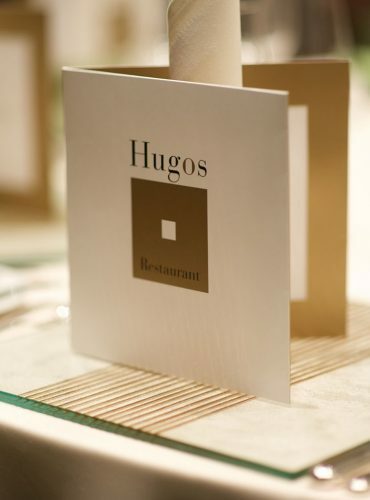 There are two menus available at Hugos, from which dishes can be removed or exchanged, and wine pairings are available. Our waitress, Maria, was quick to accommodate our only change to the selected menu (I will elaborate later) and we commenced our dinner with a glass of Brut Réserve from the small champagne producer Bérêche et Fils, and a trio of intriguing amuse-bouche, including a beer and parsnip ball atop a piece of meringue. 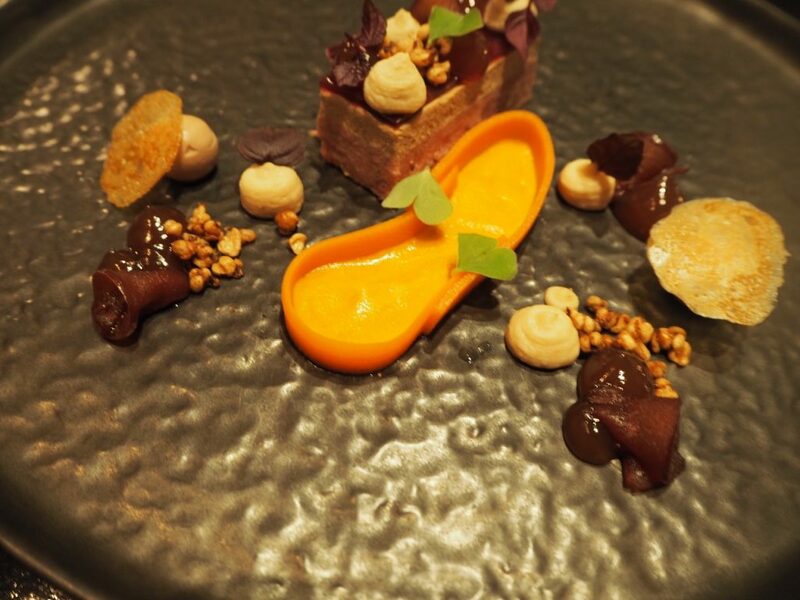 The first course was Oldenburg duck terrine, smooth liver and plum jelly layered on top of mouthwatering shredded confit leg. 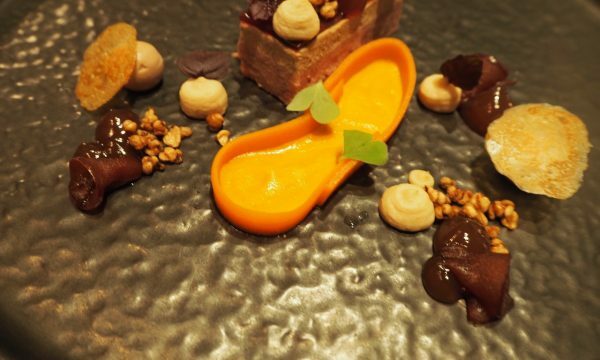 Some toasted buckwheat provided a textural contrast and a carrot and tonka bean accompaniment had a warming flavour, although the presentation of this element of the dish looked oddly unrefined, and a little like an orange paddling pool. The accompanying wine, a Rheingau Reisling Wallufer Oberberg 1990 by J.B.Becker, had hints of tropical fruit that added complexity to the duck dish. We continued with a lobster dish that was smothered in brown butter foam with some Asian flavours in a daikon roll. Again, there were significant fruity and sweet elements, this time in the tanginess of passion fruit in a mousse and a small slab of meringue, although the overall sugariness was somewhat reduced by a pairing with a lightly floral Dreissigacker Einzigacker Pinot Blanc. The pairing for the third dish returned to the Reisling grape but ventured into Austria, with a Ebner-Ebenauer Alte Reben that was clean tasting and reminiscent of apricot. 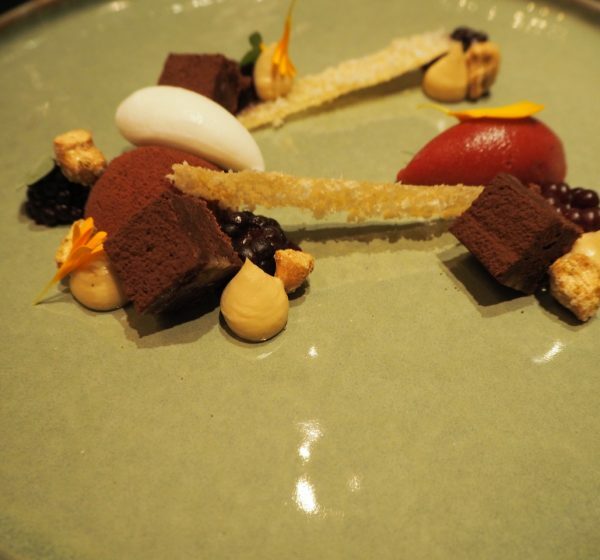 It was poured alongside a dish of char, which had a delightful saltiness in its crisp skin and combined well with the chunks of Boskop apple with which it was served. I felt as though the horseradish element of the dish faded a little into the background, but the fish was well cooked and emphasised by the garnish of char caviar that made it the star of the show. Our main dish was venison from Schorfheide, served with a fruity and complex Schiefer Szapary Blaufränkisch 2009. A perfectly rare fillet from the saddle was the centrepiece, but a baked bonbon of shoulder, bursting with meaty jus, was a thrilling additional element. The meatiness was cut through by sweet beetroot and elderberry notes from the sauce, as well as the creaminess from the poppy seed cream (which had been billed as foam, but was rather more of a puddle when it reached us). This was a really delicious dish for any carnivore, the kind of warming combination that is very difficult to present with any degree of finesse, but Hugo’s have done this very successfully! 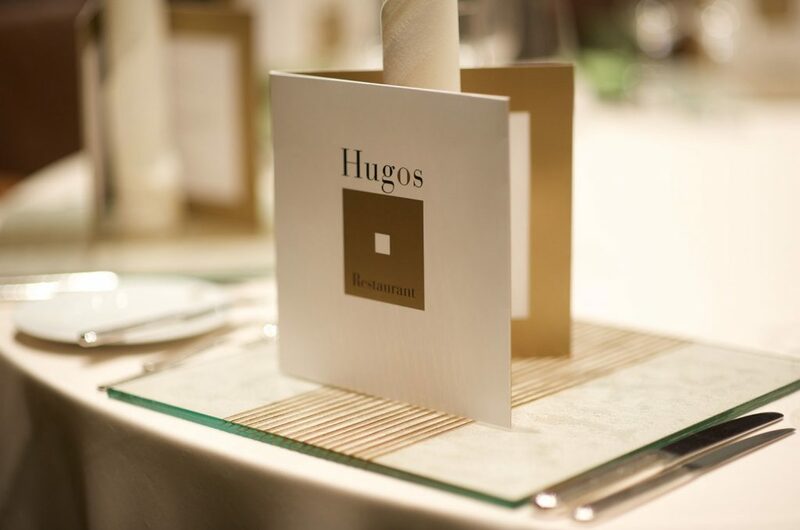 Hugos was incredibly convenient for us while we were staying at the Intercontinental Berlin, but it is also well worth making a trip there. The staff are welcoming and the food is good enough to distract you from the view, which is a pretty incredible thing. 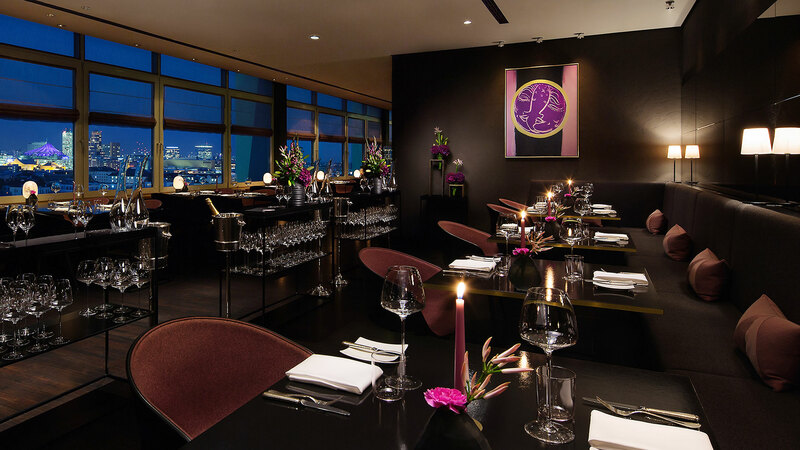 In Berlin’s fine dining scene, this is a restaurant that rises to the top.